We fell in love with the California group’s Peanuts gang pictures on here and no matter how hard we tried, we couldn’t find a better idea for our group. Thank you very much for your detailed plan. 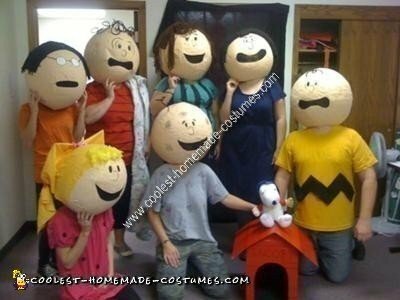 We, too, were a huge hit in our Homemade Peanuts Gang Costume!!! 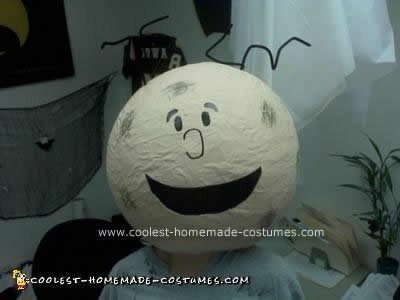 We used punching balloons (as beach balls were out of season) and homemade paper mache for the masks. We primed and painted the heads. Used sharpie markers for the facial features and pipe cleaners, felt, and yarn for the hair. (Lucy wrapped felt around dollar store curlers). We cut the mouths out and covered them with see through mesh for viewing. The heads were very difficult to keep “upright” but if one planned on wearing them for an extended period of time, putting a baseball hat inside the head and then slipping in on your head, might just help the “wobble”. We all did our own clothes per each Peanut character. I made the Snoopy house out of cardboard boxes and red duct tape. Very cool idea California! These are keepers!